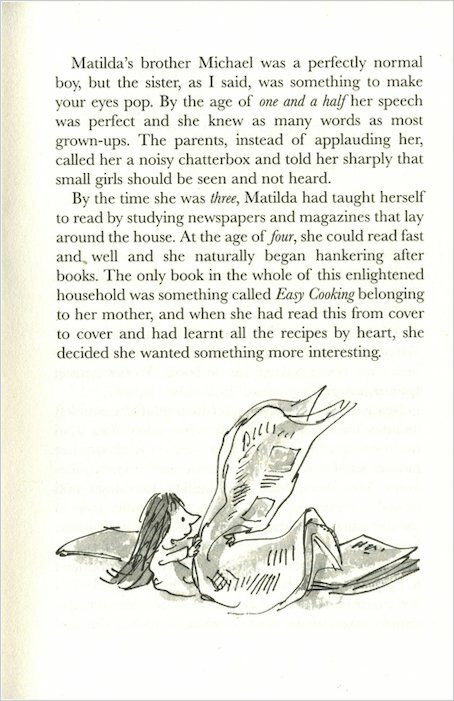 This is about a girl called Matilda who loves to read. Very entertaining and enjoyable! I wish I was like Matilda, the child prodigy, except not with her family. I’d love to have Miss Honey as a teacher. Moreover, if you have not seen the film, it is advisable to read the book first! I find this book quite funny interesting and supercalafrajalisticexpialadociously good I would recommend everyone to read this my favourite part is the chapter called the hat and superglue as that is quite funny as the film! Matilda is a five-year-old genius blessed with amazing mental powers. She loves to learn and has read all the great classics of literature – but instead of being proud, her horrible parents call her an ignorant liar. But when they and her vile head teacher Miss Trunchbull try to ruin her life, they’ve reckoned without one thing Matilda can do which nobody else can. This book was nothing even close to rubbish. It was enchanting in the way that Matilda cast her underdog like charm over you as you read and she seems so little and innocent, but she can do the most amazing things. I’m not going to spoil the end for those who are currently reading it, but you folks will never expect what’s coming. I’m finding it good so far because I’m up to page 3 and I think it is good. I definitely recommend this book to everybody. It is filled with good humour and BRAINS!!! Matilda is a very brainy girl and if you know she has the power to knock the headteacher down to the floor.  I recommend this book to everybody like I’ve already said. This is probably one of the best books I’ve ever read. This is a fabulous book! Written by one of my favourite authors this book is so funny an quite magical. 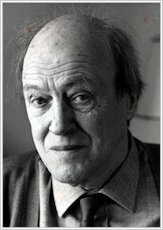 WELL DONE TO ROALD DAHL! This book is very good for girls. I could not read it more than once though. I loved this book. Its amazing and teaches children to read more. 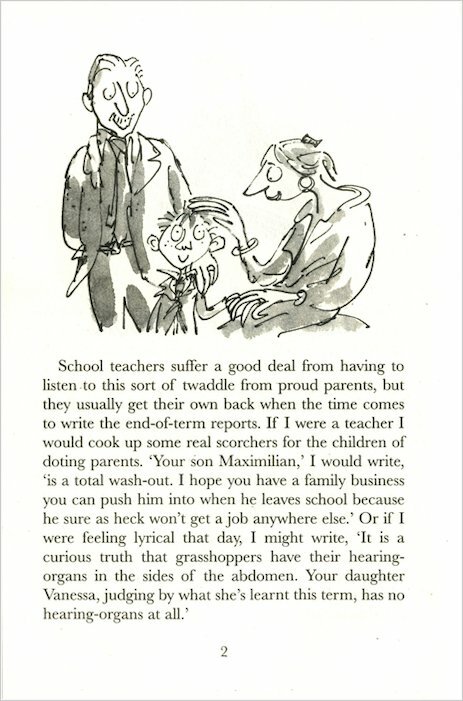 I would reccomend it to any child who likes reading rahl dahl and likes books about school and bad teachers. THIS BOO IS AMAZING. I HAVE TO SAY THAT THE AUTHOR JUST PULLS YOU INTO THE BOOK AND IT ALSO MAKES YOU ADDICTID TO THE BOOKS LIKE WHAT HAPPEND TO ME. This book is a classic and i have read it several times, I’m sure lots of people sometimes wish they had Matilda’s powers. miss trunchbull is so mean! a story to make magic come alive! 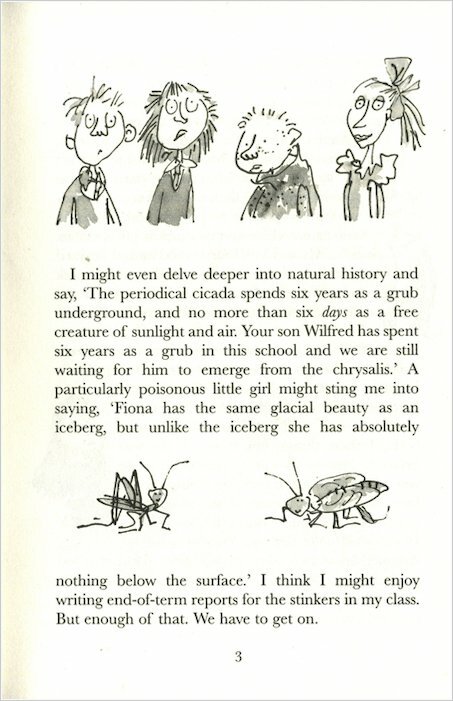 Like all Roald Dahl – funny and imaginative! Very enjoyable read. 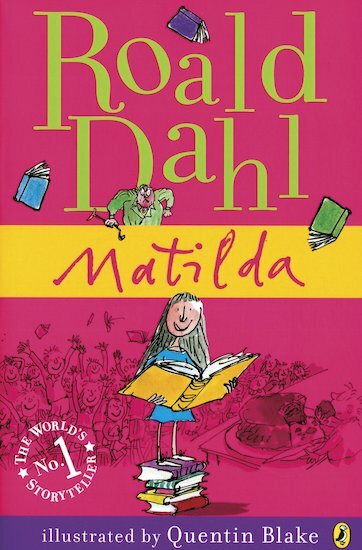 Roald Dahl’s Matilda is loved by all the world, including you. It’s all about a girl who discovers that she has powers. Read it to find out more. This book is about an extremely clever girl called Matilda. Roald Dahl is amazing.Matilda is really good and Miss Honey was my favourite because she is so nice! I loved this book!!! This has to be the best Roald Dahl book going! This book is not anyone for the faint hearted though, there’s a lot of violence and very sad as well! :( please read!! If you don’t want to read it why don’t you go and see Matilda the musical in London?! I am!!! it was really good, i enjoyed it sooooooooooo moch!!! Its a bit of a nonsense book but I think it is cool…even at 14 although it is getting a bit young for me! i love it i went to see the live stage show!!!!!!!!!!!!!!!!!!!!!!!!!!!!!!!!!!!!!!!!! I liked the book,and my favourite part was when miss Trunchbull was scared of the chalk and when Matilda went to live with miss Honey, that was a happy ending! Matilda is marvellous. 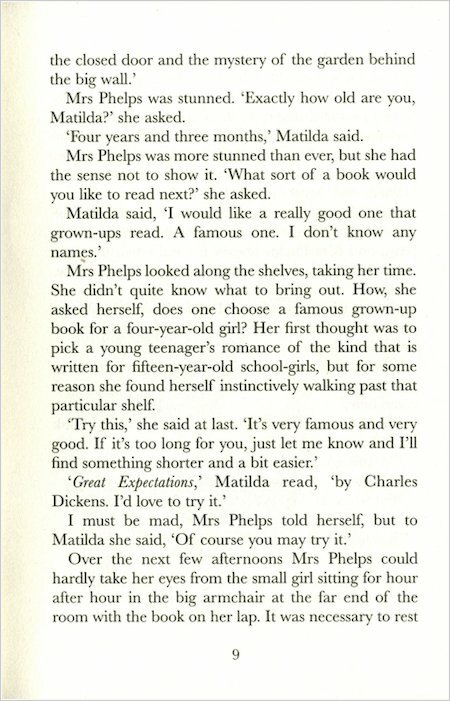 It’s about a girl called Matilda who is super intellegent. She could tell you what 14×19 is in a second. You just had to read it.And if do start reading it you will tell yourself you just have to read it again and again and again. Out of 100% I tell you it is 100%. 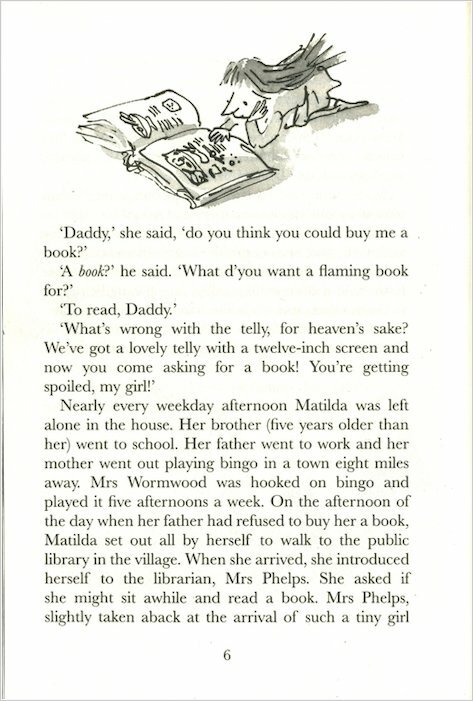 If Matilda is the first book you are reading you will just tell your parents you want more of the Roald Dahl books! Roald Dahl has always played an important part in my childhood. 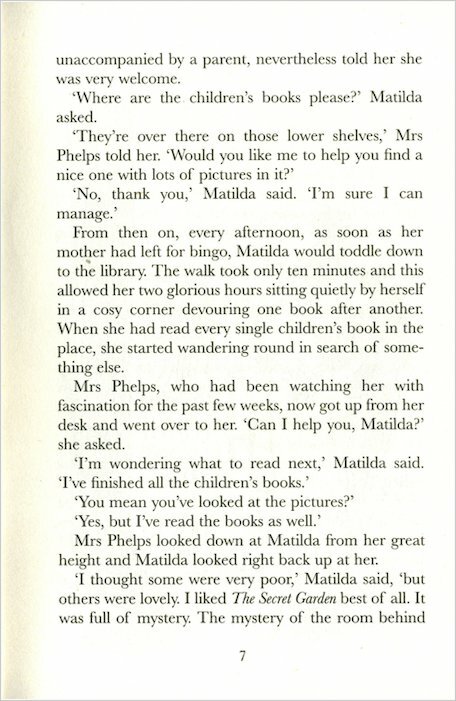 It was like the books were an example for allmothers, and I remember picking up Matilda for the first time from a book shop and being shocked at how much i’d been missing out on. It’s both witty and yet quietly sad, a brill read for first time readers, or anybody who loves a bit of Roald Dahl. The best Roald Dahl book ever. This is a great read!!! i loved this book especially as Matilda is just like me we both love to read! This book is a book that kept me going on a trip away from my parents. Its a book about lies and thieves and a head mistress with terrible rules. I read that once the headmistress didn’t like a girls plaits. So she threw her over the fence. 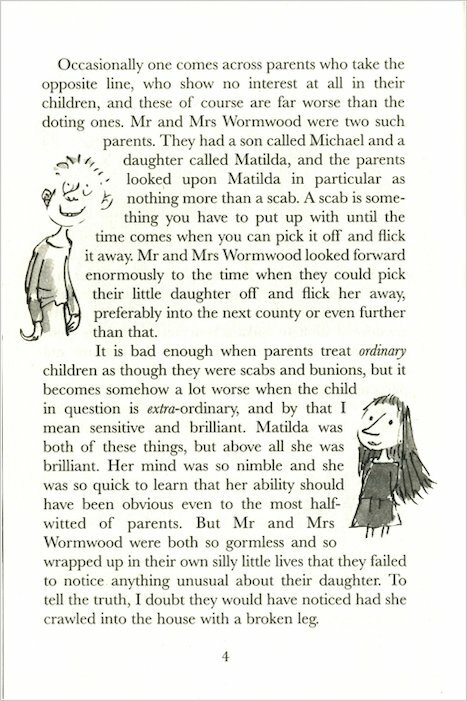 I just LOVE all of Roald Dahl’s book they always paste a smile to my face. my head teacher dressed up as mrs trunchbull. A very interesting book! I love it! A must read for EVERYONE – even for grown ups! i loved this book. i read it twice all the way through!!!! it had me laughing my breath away!!! it was so funny when the newt is in trunchbulls water!!!! i was 8 when i first read it!!!! READ IT!!!! This book is fantastic. Matilda is so clever. She is the cleverest girl I have ever heard of. I would read this book millions of time. I thoroughly enjoyed this book as I love Roald Dahl books also because I love the story line! It has humour in it which I love and I especially like the ending! This book is about a little girl who wants to study and the parents just was t.v. all the time. Matilda went to a very strange school with nice childrens and 1 bad headteacher. Matilda had magic powers because she had knonlege that nobody has in the school she goes to. It is just like the rest of his books pure genus!!!!!!!!! He is the best writer in the world!!!! 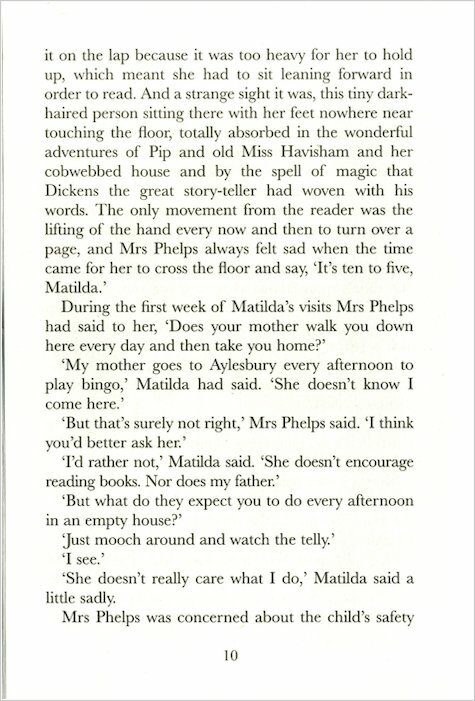 I like the story Matilda and the character. Miss Trunchbull is the worst head teacher ever. Lavender is the best friend ever and I liked it when she got that newt and put it in Trunchbull’s drink. I love this hilarous book, as it makes me and my brother laugh and cry at the same time. 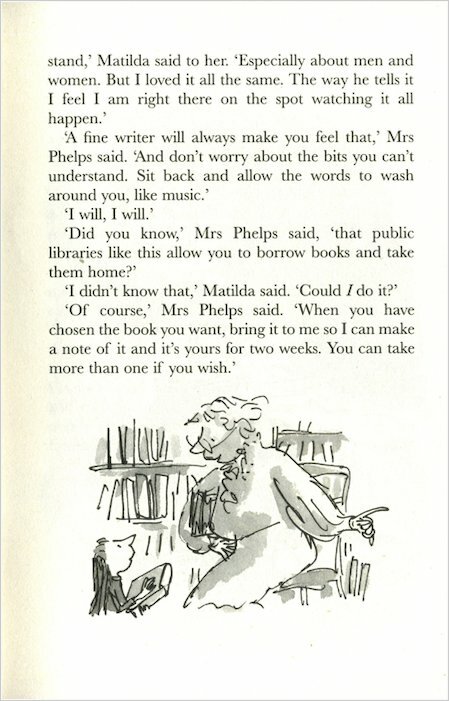 Matilda is a clever child who gets what she wants in the end. I wish I was as clever as she was. Really funny and all a girl would ever want to be able to do (and a boy for that matter). It served Miss Trunchbull right for being so mean! 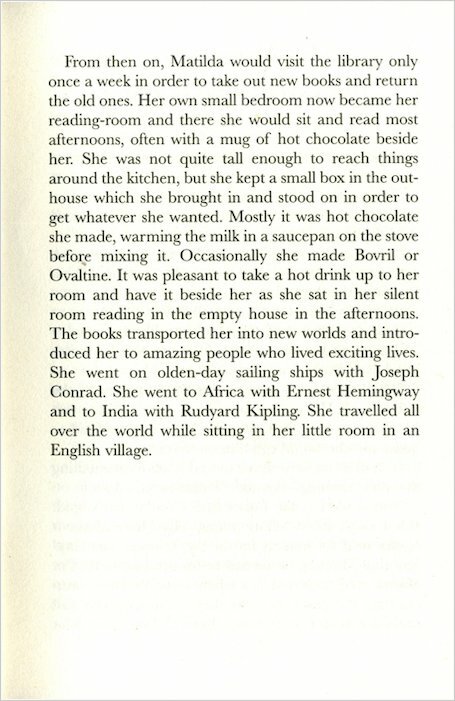 Miss Honey was really lovely and it made you enjoy the book alot more. Matilda is a very intelligent girl who started to read when she was 3 years old she had spoiled parents that thought always that Matilda is spoiled. Matilda’s parents always thinking the opposite way. I would even recommend this book in this PLANET! THIS WAS MY FIRST ROALD DAHL BOOK I HAVE READ.WHEN MY SISTER GOT THE BOOK FROM HER FRIEND I TREID A PAGE AND I LOVED IT LATER WE ORDERD THE FULL SET FROM A SCHOOL ORDER. IT TOOK ABOUT 5 MONTHS TO READ IT. 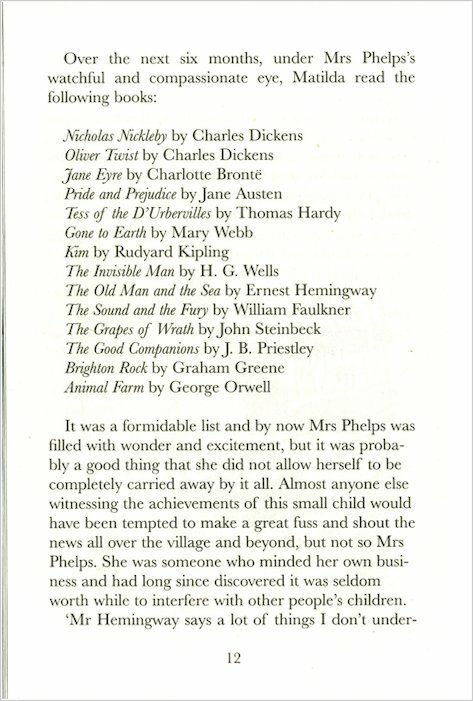 BUT THE OTHER BIG BOOKS TOOK ABOUT LESS THAN A MONTH TO READ.HER TEACHER, IT IS NOT A NICE LIFE LIVING IN HER HOUSE. HER DAD IS SOOOOOOMEAN I WOULD HATE A DAD LIKE THAT. I WONDER WHAT HER LIFE WAS LIKE AFTERTHAT.I WISH I WAS LIKE MATILDA WHEN IWAS 3.AND IF I WAS MATILDA I WOULD LOVETO GO BINGO WITH HER (BUT WITH MY REALMUM).I HOPE HER FAMILY STAYED IN SPAIN. Fantastic! I cant believe they treated her like that! This book is about a girl called Matilda and her parents who were very mean.One day when Matilda went to school she met a nice lady called miss honey and a mean lady called miss Trunchball. find out more when you read…MATILDA! This book is great!!! I loved it so much that i read it in one night. This story is about a girl who is only 4 years old and has a pasion for reading although her parents are aganst it. 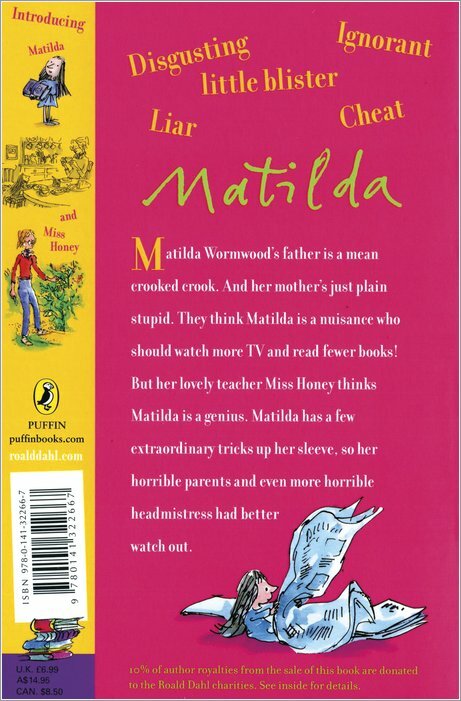 When she starts primary school she is the smartest in the class, Miss Honey (her teacher) is amazed at what she can do,but Miss Trunchbull (evil headteacher) hates her so can Matilda save the day? This book was amazing i liked the bit were she writes on the chalk board and Iwould reccomend this to anyone and everyone. Though it’s long it’s NOT boring and know is my 2nd favourite book. Hope you like it as much as i have. Matilda is a funny, exciting story about a 7-year-old genius. Matilda’s family are all couch potatos and they do nothing but watch tv and each off trays in the living room, whereas matilda loves to sit in a corner and read a good book much like myself. Her family don’t except her or even realise she’s there at all. 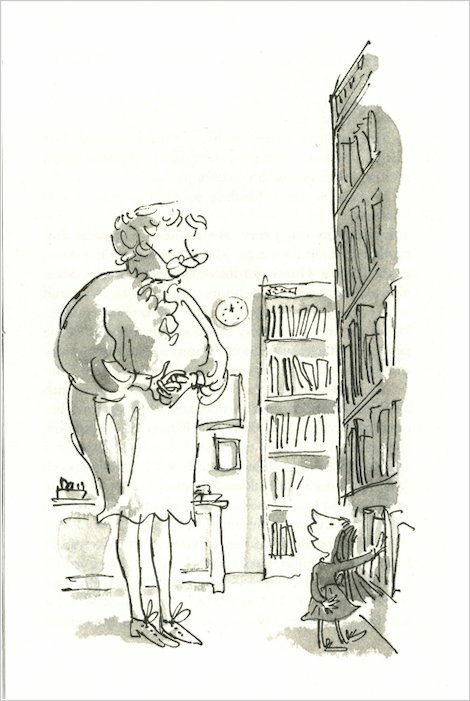 Matilda go to school and has a lovely teacher, Miss Honey, but a horrid Head Mistress, Miss Trunchbull. I would recomend this book to every one I know. I think they would love it, so you should give it a go. I loved this book partly because the character is basicly the same as me. It is such a good book i have read it and watched the film it’s really brilliant but the parents are so bad and don’t really care about her. also Matilda has magic powers if you haven’t read this you should because it is a amazing book so get reading. This book is wicked and is an awful shame roald dahl died. This was a classic, funny book that anyone who wants to read has to read! Mrs Trunchabile is a TWIT!!!! i think this book is FAB !! I found this book very interesting and amusing. I felt for Matilda and at times felt like I knew how she was feeling. At the best of times, I felt anxious and eager to find out what was going to happen next! It most certainly was a book that I could’nt put down!! 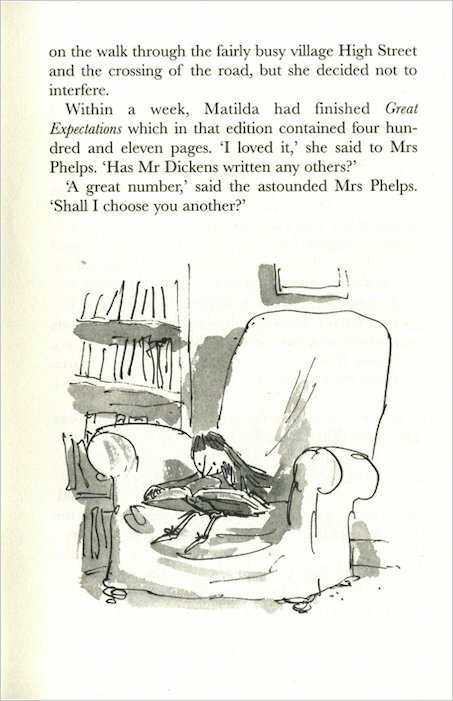 This book also encouraged to work through Roald Dahl’s collection and to continue reading his fabulous books! I think Miss Trunchbull is really really strict! And Matilda’s parents are’nt really bothered about her education or the special power that Matilda has got herself. This is definitely one of my all time most favourite books! 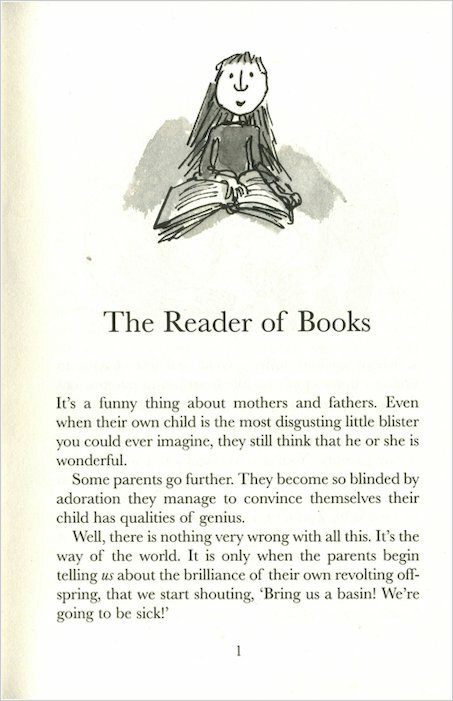 Roald Dahl’s books are magical! I loved it more than words can say. 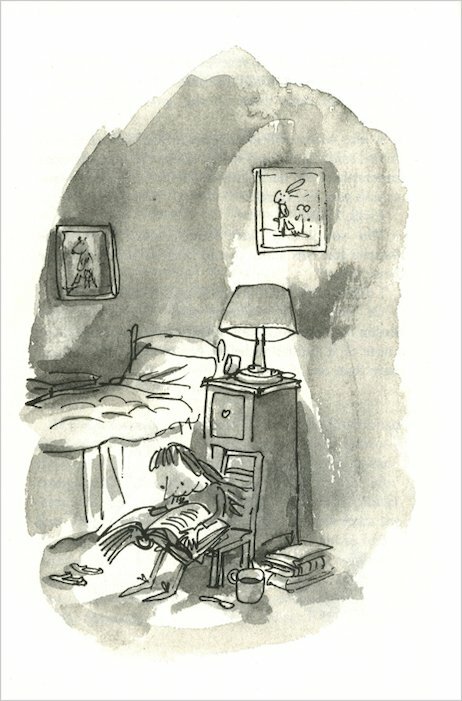 I love Matilda, it is one of my favourite books of all time. I also like the film.